I am satisfied. It took me more time than I planed, but it worth. When the hexies didn't travel with me, they were in my mind. From the beginning, through process to the final look. 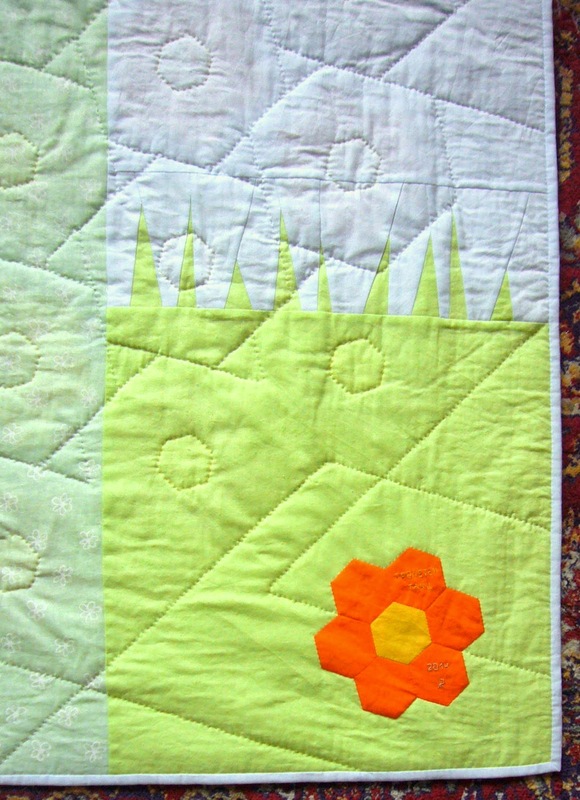 Especially like the sky and grass quilting . I rejected some other designs and sure this one fit perfect. The grass is pieced by machine. 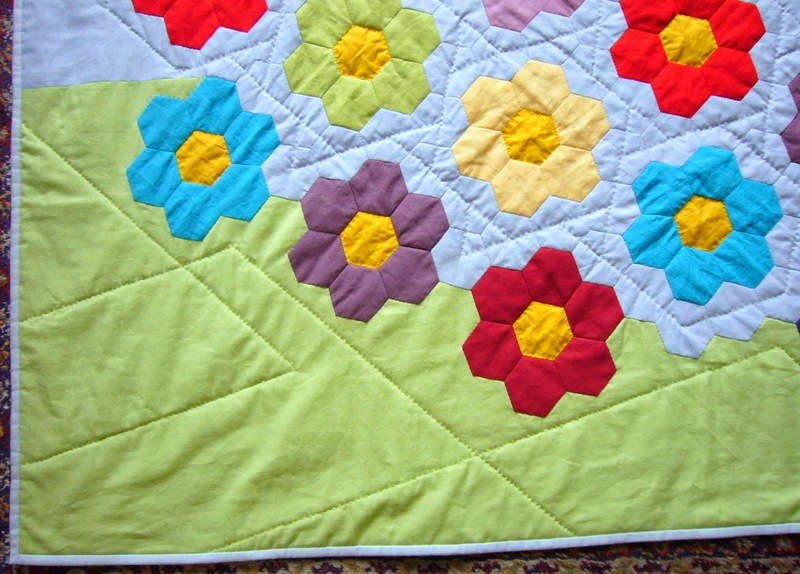 The whole top is sewn and quilted by hand. I put a flower instead of label. Here it is on Mom swing. When you are wandering about fast and funny Easter gifts you should make some of these coasters. I intended to visit a friend of mine and suddenly I understood there will be other three friends. I have one day to make small and unique gifts. I need 2 and a half hours to create these colorful coasters. I have experiment with different styles for eyes. You could make them different color, too. 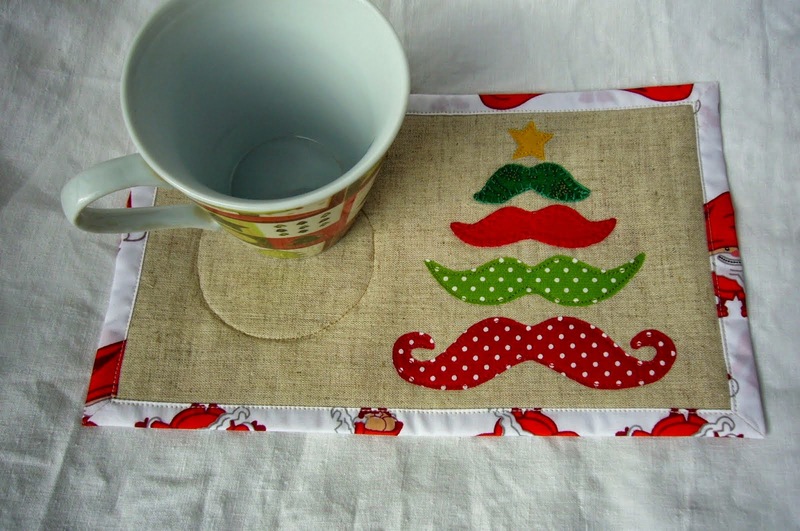 You should made the coasters double sided or simply put an interesting printed fabric on the back. 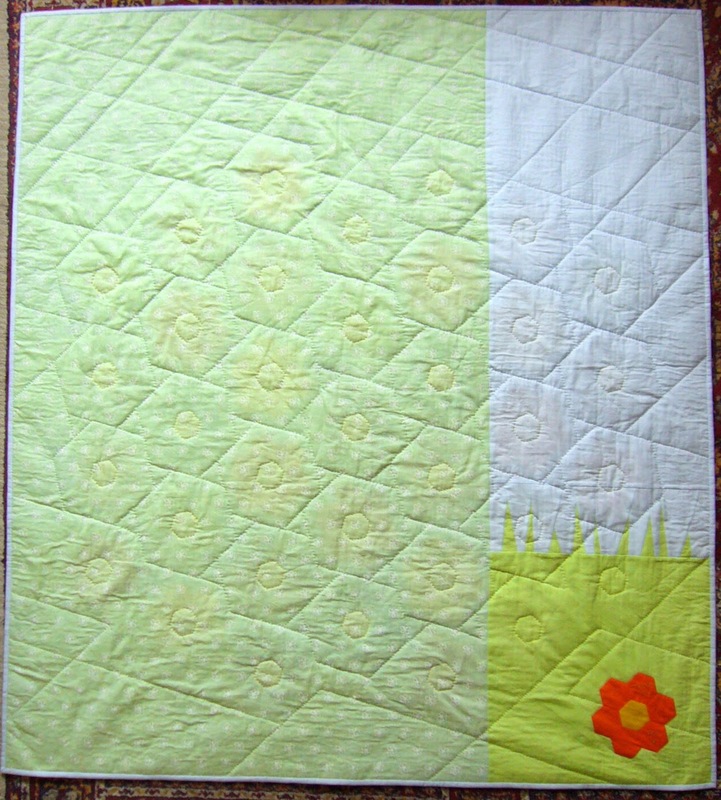 Today I am working on Springtime flowers mug rug Swap organized by Michelle from Quilting Gallery. And have two secrets to share. I always have difficulties to applique by hand when fused 2 or 3 layers of fabrics. So this time I thought a little how to avoid such problem. You have to fuse only the outer sides of the piece. Trace the shape on the paper. Fold and cut a strip around half inch. Unfold and you will have this one. Place the new shape on the wrong side of the fabric and fuse. Cut follow the outer line. Remove the paper, place on the proper place of the mug rug top and fuse. Second idea is about the flower. Trace the flower and cut the paper. Cut carefully the center a little bit outside the circle. Fuse the shapes on the wrong side of chosen fabrics. Remove the paper from the circle only and fuse on the proper place on the right side of the flower. The paper on the back of the petals prevent its fusing. Remove now the paper from the flower , place where you need and fuse. Applique by hand or by machine. It is very easy to stitch. I think I have the longest postponed project. Two years ago I have finished this top. I like it too much, but was a little bit bored with hand stitching. 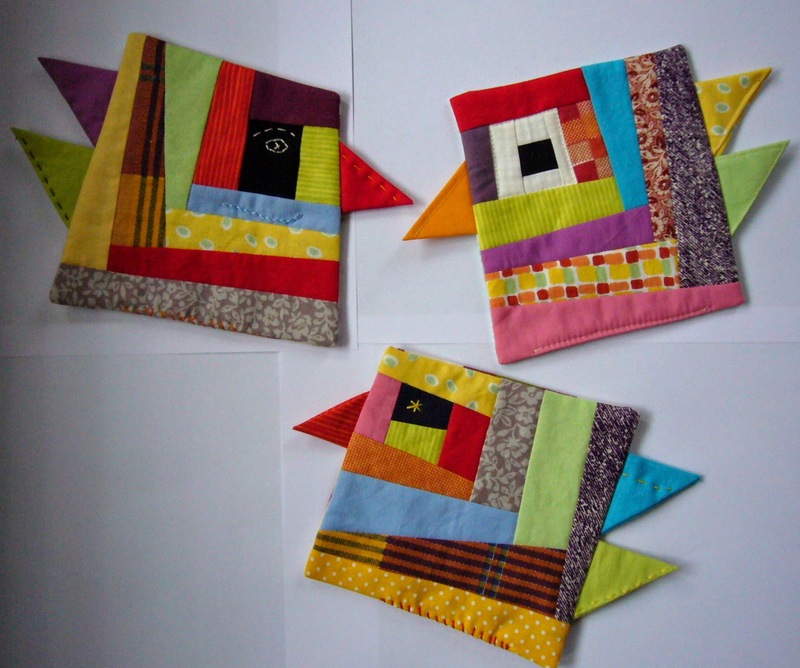 The quilting has to be made by hand too, so I had put is aside for better days. The truth is that if you have no desire for something it goes bad. I wandered if it is wall hanging or lap quilt - size is 60 by 50 inches. Put a thick batting and sandwich, but didn't like the hand stitching and ripped it. Now I basted with a thin batting. I have been quilting for one week and am happy with the design I have chosen. Here is a small detail of it. 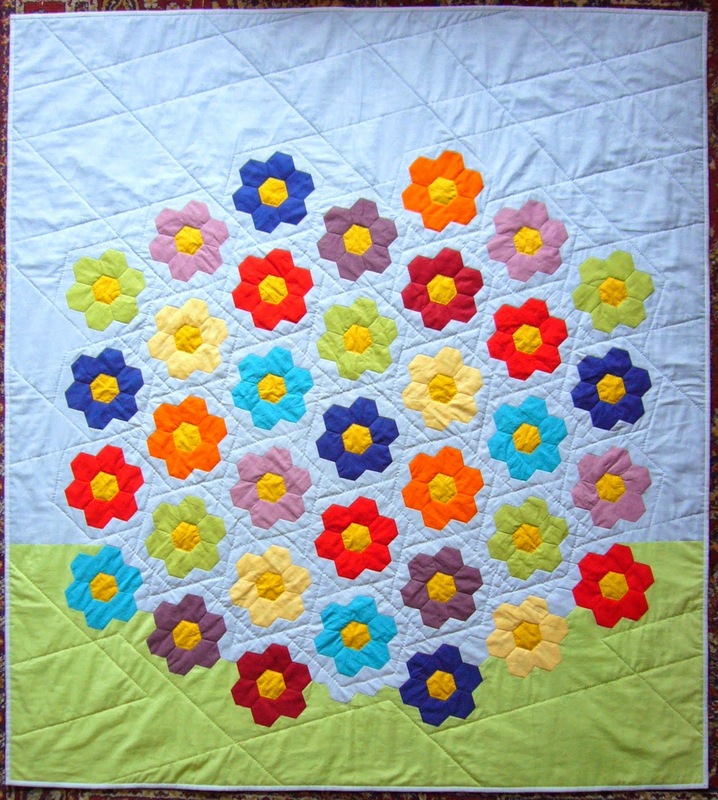 I intend to quilt the center of the flower with yellow thread following hexagon's sides. But this will be the last action. Now I am focused on finishing quilting with blue thread and binding. At the worst till the end of month. Although April Fool's day I was a little bit sad. What I had seen when opened comments on my previous post? What a happiness to read such lovely words. And what next? You will receive this pattern for FREE. My family name means joker, a man who makes people laughing. So I have to celebrate.